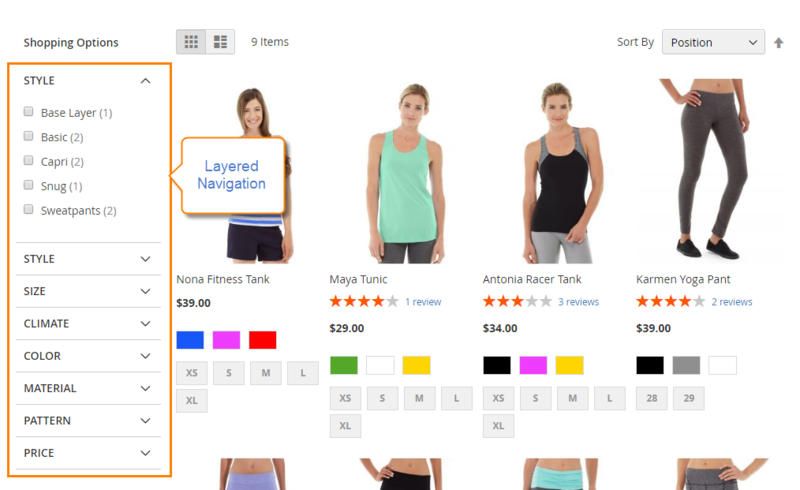 Magento 2 Layered Navigation extension is the advanced sitemap you can show on online store. It includes full of product attributes your customer need to filter the desired items and purchase them quickly. Especially, integrating Ajax technology allow showing all search results instantly on the current page without reloading the whole page. Mageplaza Layered Navigation’s User Guide will provide the detailed instructions to know How to use on the frontend and How to Configure on the backend. After enabling the module, Layered Navigation is shown with a list of product atributes on the left of the category page. In the General Configuration, Choose “Yes” in Module Enable to turn Layered Navigation on. No means the vice versa result. Click red button Save Config to save change. Open the product attribute section and choose one option as need. Similar to other product attributes. Display the matched items via Ajax Loading. Add the favorite items to cart. Price Slider allows sliding flexibly the bar to define price range instead of entering manually. Shop by section will list all filter activities for the displayed results.